Fast forward a year and I became a leader for Rising Tide Society and the founder of San Diego's North County Chapter. Which this great leadership position introduced me to their Workflow System, HoneyBook. My workflow system at this time was just not efficient. I was paying for and using Docu-sign and having my clients pay through Square. Two completely separate parts that I would have to jump back and forth to. Oh, and let's not forget that I was writing my shoot dates down in my planner and on iCalender. Plus, jumping back and forth to my emails to look up clients needed info for contracts. An all over the place mess, right guys?! 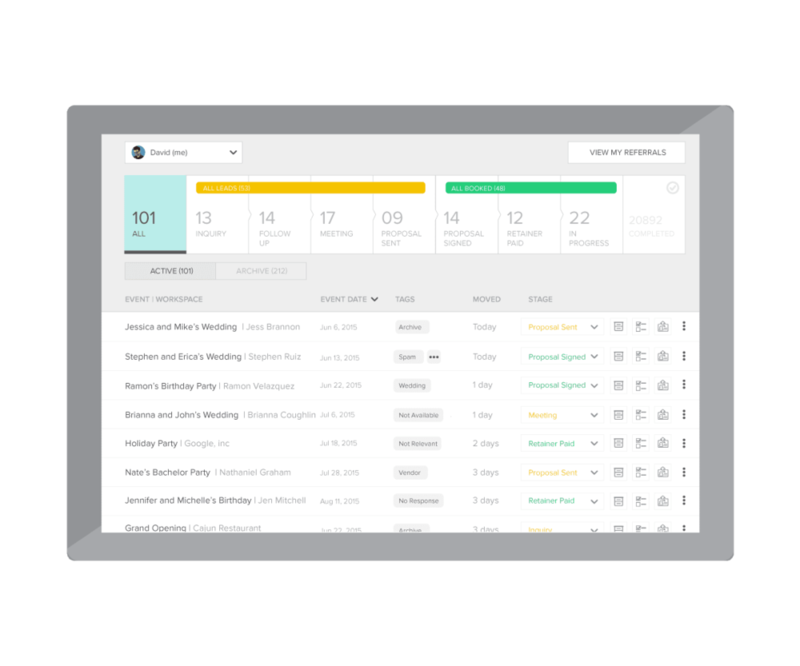 HoneyBook calls it the pipeline and my customers call it their personal assistant. When you have multiple shoots to manage it’s so easy to track the status of all your shoots, in one place. Whether it’s an inquiry, a proposal or a follow up action from your client, with one click you can tell if you’re on track. You can also easily assign a project to someone in your team, right from this pipeline. HoneyBook makes it easy for me to respond quickly to inbound inquiries from my website. It’s easy to create a custom form and embed it easily into your website. When a potential customer fills out the form, HoneyBook automatically creates a new lead and adds it to your pipeline. Jumping back and forth entering in your leads information can be extremely time consuming. When you are managing not only your business and your personal life, this proactive perk for your business cuts down greatly and saves you time. Nothing worse for your client is to have them jump around to different platforms for sending/receiving contracts and submitting payment to you. It should be an easy and efficient streamline of delivery with the booking process. Because it's all about GREAT customer service! AMIRIGHT?! Your proposals, contracts and invoices should reflect your brand. their simple templates allow you to upload your logo and banner, customize your contracts and packages, get e-signature, automatic payment reminders and more. Girlfrannn say what?! Yes. I said it. What peaked my interest with #HoneyBook was the fact that they offer a 14 Day free trial. You have access to the complete system and their fantastic concierge. I genuinely feel that they are about your success and what is best for you business. This is why they generously offer the 14 day trial, with no credit card. With 65,000 members and growing I feel their integrity they display for our creative economy is what is attributing to such rapidly growing member numbers. 6) WANT A DISCOUNT AND REFFERAL CODE FOR SIGNING UP? "Oh, hey Lacey O. I thought you said there were only 5 reasons as to why you chose HoneyBook for your creative business?" Why yes friend I did! But, since I received such love from HoneyBook, I want to give love! http://share.honeybook.com/fQWtq to receive 50% off when signing up! Like, Happy Valentine's Day to you, right?! Mornings are rough. It can be hard waking up if you are not a morning person. Oh, and let us not forget the to-do's on our mind as soon as we wake up. These things can instantly cause a negative morning. As much as I'm not a morning person I'm more so not a person who likes to set up the day negative as soon as I get out of bed. So here is my morning routine and priorities that I do to set my day off right for myself, family/friends and business. Today I'm excited to announce that I was featured on Photographer's Edit podcast and blog! I had a great discussion with CEO, Nathan Holritz of Photographer's Edit about attracting the ideal client, being a busy entrepreneur, and putting my family first before business. Also, when you utilize Photographer's Edit for your photography needs, you can use promo code: LACEYOPHOTOGRAPHY to get 20% off your purchase. As you grow in your photography business it is a great feeling. The thrill of your growing numbers of shoots and clients is obviously ideal. Until you realize how much time you are spending in front of your computer... editing. UGH. My photography business tripled in a year and a half when I first opened in September of 2013. A total blessing but I was constantly in front of the computer editing and I felt I was spending less quality time with my husband and children. I'd go to bed and lie awake feeling a sense of guilt that I didn't talk to them enough of about their day because I was constantly editing in my office. I also felt like I was getting behind in other areas and to-do's of my life that were important. Which causes unnecessary yet added stress. I personally feel that your family comes first. The time you have with your family and all that goes along with running your family is not given the most and best of you, there is no true success. This is why I decided to out source to Photographer's Edit. Why? I knew I had to manage my time better and less stress. I'm a full time photographer, entrepreneur, Leader for Tuesday's Together in Oceanside, CA for The Rising Tide Society, a mother of 3 and a spouse to a very busy United States Marine. And to be honest furthermore, I'm not a big fan of tedious color correcting. Photographers Edit will handle culling, color corrections and custom retouching. I upload my photos, they tell you how many days it should be completed in (they are super timely) and its emailed to me to my specifications. You can set your white balance, brightness and contrast through them so that your photos remain consistent with your photographic voice along with 2 presets and it costs about 23 cents a photo. Since I have been outsourcing to Photographer's Edit I feel a huge weight lifted off my shoulders with the editing process. I have more time to spend with family, friends, other areas of business. This is a huge blessing to me and I'm grateful for such a company in my industry that helps enrich the quality of a busy photographer's life. As I started my journey, 3 years ago, as an entrepreneur in the photography industry I was ignorantly optimistic on what it really is to be an entrepreneur. I had sugar plum visions of only glitz, glamour and grandeur. Although those things do come with hard work and time, I had never ever felt more alone in my frustrations and development. Don't get me wrong, I had a multitude of support from my spouse and friends. But there was something still missing. I just couldn't put my finger on what was missing. I was constantly was talking to God about it and asking for guidance and direction. I was carrying this alone feeling around for about a year and then one day while I was surfing the web I stumbled across a article about how an “entrepreneur needs community and support.” and recommended the Rising Tide Society. To be honest I didn't read the whole article through. I was skim reading but when my eyes fell upon the words "an entrepreneur needs community and support." Man oh man did those words sync with my alone feelings I was struggling with. I quickly looked up their website and fell in love with the Rising Tide Society's why, purpose and mission. A society that is about community over competition along with being a place to encourage, support and educate small business owners. But it gets even better than that! Around the U.S. creatives and entrepreneurs meet in different cities on the second Tuesday of every month over coffee and conversation, to learn, build, connect, support and grow. This fabulousness called Tuesdays Together. Where I’m at now with the Rising Tide Society I couldn’t be happier. I was selected by the Rising Tide Society to start and lead a Tuesday’s Together chapter in Oceanside, California and serving those that are in the Surrounding North County of San Diego, California. I have gained many friends, many resources and continue to grow as an entrepreneur and leader through the Rising Tide Society. So if you are feeling alone and lost in your entrepreneurship, just know you got a friend in the community that is the Rising Tide Society. And when you have connected with your Tuesdays Together group, let me know! Comment below or shoot me an email. I'd love to hear about it! With shoots and demands of business sometimes to refresh my creative soul I create something that is not in relation to my trade. Sometimes I paint a picture, sculpt, do a furniture make-over, etc. In turn the creative projects restore that balance of fun and I come back to business with renewal. What is something you do to refresh your creative soul? "Always Be A Work In Progress" What is an inspirational quote you love? I'd love to hear it! In a world where "busyness" is valued more than presence, today I'm posting a photo of how I relax... Taking my children to the park with my husband. To be real, I'm a work horse when I put my mind to something. I forge away until what is in my mind is fully accomplished. It is a good thing about me & a bad thing. As I grow in my business which in turn is me growing more in my character, I've come to the realization that no amount of busyness, hustle, grind & success is worth not spending time with those you love. Time is a fleeting thing & so very precious. When I make sure to put my family as a priority & give them the very best of me (not what is left over from my busyness) I'm enveloped in peace & contentment. My balance is restored & I can get back to work refreshed. On an entrepreneurial/creative high, we're getting things accomplished and knocked out of the way. Giving out high-fives left and right! The following week rolls around. Same grind. Then the next. Then the next. To where it starts to resemble the movie Groundhog Day with Bill Murray. Then it happens... loss of motivation. When this happens to me it's not because I stopped loving what I do. It's because I have been sitting in the same office, my office, for a few weeks straight. For a creative mind, that's a no go. I need stimulation with sights, sounds & sunlight. So what do I do? I GET OUT OF THE OFFICE. I change my scenery and work from somewhere else. It could be a cute coffee joint, a park, a local winery or like this week... the beach. A change of scenery refreshes the senses and you're still getting your work done. Oh the busy photographers grind... answering clients questions, meeting with clients, scheduling clients, arriving at photoshoots and editing. The workflow list goes on and on. But thats just business... don't forget your personal life (me being a mother of 3 and married to a Marine my schedule is insane!) Sometimes I get so busy in a day I forget to eat. Actually strike that, I'm starving and the epitome of the word "HANGRY" but I grit through it because I have a job to do. The more your business grows the busier your schedule becomes the less time you have to take care of yourself... but you must make yourself just as equally a priority so that you can run things with the utmost opitmitization. I saw on Pinterest this idea on making layered salads in mason jars! I prep mine on a Sunday night for myself and my family. They stay fresh and easy to grab and throw in your tote when you are on the go! Chop full of energizing goodness that will refuel and refresh you!